Umm ... wrong ... How on earth does a short story cost less? Most authors spend the same dollar amount on their cover, and it doesn't cost anything to upload it to Amazon. Time ... maybe ... but even that seems silly, as authors who write short stories, usually write many of them. I think authors write short stories because they enjoy writing short stories, especially in between large projects or while waiting for their editor or publisher to finish reading their current project. "Short stories date back to oral storytelling traditions which originally produced epics such as Homer's Iliad and Odyssey circa 7th or 8th century" -- Wikipedia, again (I didn't see the need to research further.) But I say they go back even further ... Jesus told parables so that his followers could better understand his teachings. 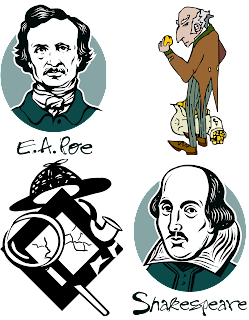 Charles Dickens and Washington Irving -- who were famous for novels and biographies -- wrote short stories, and of course, Edgar Allan Poe argued that a literary work should be short enough for a reader to finish in one sitting. And yet, when I went looking for advertising, I found it almost impossible to find a website that was willing to promote my short stories ... even if I was willing to pay the same amount as I would to advertise a full novel. I also noticed many publishers refuse to publish short stories, which as far as money goes, I can understand that. They would have to shell out money for a cover for little return. And now for the craziest thing, I wrote my short stories, knowing I was going to give them away. Yep. I wrote my first short, The Pit Stop, as an exercise and to have fun with my readers, which a lot of them happened to be authors. We'd write five hundred words a week on my website, and when we finished, I informed them I'd publish it and pay tribute to my top contributors. But then something happened ... Readers demanded more -- I love it when that happens. Per readers' requests, I wrote The Depot. And then ... based on those two short stories, again per readers' demands, I wrote a follow-up novel. And with no awesome book advertising, but because of word of mouth from some great readers, The Pit Stop and The Depot hit #1 in Mystery Short Stories and spent plenty of time in the top 100 in the last few years. When I received my rights back from the publisher, I had to re-upload them. Again they the hit #1 and #2 spots! The Pit Stop is still available as a free download, but I decided to include The Depot with its follow-up novel, The Library, so readers wouldn't happenstance on The Library and miss the beginning. My thoughts on short stories ... An average movie is one and a half to two hours long, and yet, it can still convey a full life -- from birth to death -- of a character. We can solve a ten-year-old murder mystery, or view a first date as it matures into marriage and kids. So why wouldn't I like a quick escape when I'm sitting at the DMV, waiting in the doctor's office, and a hundred other places where we waste hours of our time? The answer is: I do like that. In fact, I love it! I've read many short stories on car trips across the state, flights, and waiting while my car gets serviced. Short stories are a great way to meet an author without a long commitment or a nice release when you need just a little escape before going to bed, since there's no risk of staying up too late to finish the story, as most short stories take less than an hour to read. Well ... that's it ... Just my thoughts on why I write and read short stories. And so you know ... I would never think to compare myself to the "greats" I pictured above; they were just my point that short stories can be great and are an art. I have a long way to go, but my little short stories do have hundreds of reviews averaging four-plus stars. So if you want to try one on for size, you can download The Pit Stop (This Stop Might be Life or Death) absolutely FREE from Amazon here or from one of the other eBook retailers listed below. I hope you enjoy the quick escape from reality! Oh, and if you like that in-between story that we often call the novella, I wrote a couple of those too. My most recent novella, Unlucky In Love, is a stand-alone prequel to my new novel, Some Lucky Woman, and yes, it's FREE! Think of it as a thirty percent sample of a pie. It'll fill you up, but you might be hungry enough to buy the entire pie. As always, happy reading, friends. Thank you for stopping by my place and reading my musings. Remember, these are just my opinions and shouldn't be taken too seriously. If you have questions, please feel free to leave them in the comment section, and I promise you I will answer. If you're curious about what I write, please visit one of my author pages, where you can read all about my novels and short stories. And hey, I'll even give you a couple free books just for stopping by. Awesome! I agree! They also make great starts to a series. They still need a beginning, a middle, and an end, but then if readers love the characters, you can bring them back for another adventure. Carmen, I found your link on Twitter, and I enjoyed what you have to say. More power to you, I also say (for what that's worth), in driving readers by having a short story approach (or even a serialization approach, as Dickens did, for one example). From a reader's perspective, I have loved short stories in many genres, from horror and science fiction to straight-ahead literary fiction. As a writer, I really enjoy the challenge of a short story, because it requires such distillation, if not crystallization, of plot, characterization, language, and everything in between. Again, I appreciate this post. The art of the short story is not dead; I'm thankful to know that people like you are still writing (and reading) it. Wow, Leigh! What a great comment! Thank you so much for stopping by. I love short stories, and I agree with you, obviously; they are an art, one I'm not sure if I'll ever maser, but I enjoy them just the same.